Buy A New Macerator Capacitor 10uF Condenser Fast Delivery! Prices Per Capacitor, fast delivery – If you do not know which capacitor you need, please do not order contact us first, refunds not accepted. Buy new capacitors for other makes of macerators. Please do not order parts if you are unsure as they will not be accepted back for refunds, contact us first we will be glad to assist you. If your macerator motor won’t start and is humming or buzzing it most probably needs a new capacitor. If the motor turns freely by hand and it is buzzing but won’t start its probably the capacitor. If you can test the capacitor with a capacitance tester check it is in range, if not try replacing the capacitor, if the motor still doesn’t turn check that the wiring is correct and the screws are not screw on to the insulating part of the wire, it’s an easy mistake to make. If all the wiring is correct and your macerator still won’t work then the motor is probably dead. Do not be tempted to buy a cheap capacitor for your Macerator as the majority don’t work properly, they don’t last long before they blow again. 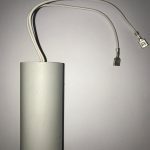 We have removed inferior capacitors bought from large department stores and capacitors which are meant for fluorescent light tubes from Macerators we have worked on, these are not good enough for a Macerator, ours are the correct ones and are heavy duty, you will not be disappointed. A capacitor is located in the electrical control box attached to the side of the motor. 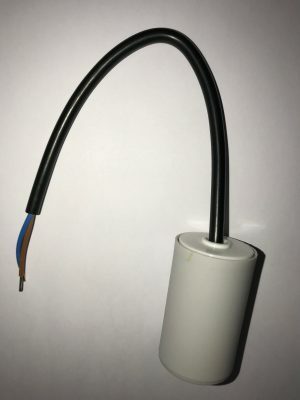 The Macerator motor needs a capacitor to start it, the capacitor can be damaged if your macerator has been blocked and the motor has been running continuously. Other reasons for a capacitor to break can be down to wear and tear, old age. After fitting a new capacitor you will notice an improvement in your macerator pump. 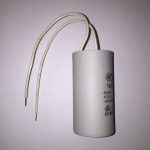 If you wish to buy a new capacitor we can supply you a new one in a couple of days, if you are not sure what capacitor you need, please contact us. Before ordering please remove your existing capacitor and check the markings on the capacitor match one of the ones below. 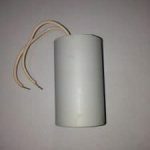 The capacitors we sell are for your Macerator are heavy duty, high quality, durable and will last many years under normal conditions, beware of cheaper alternatives as they are not up to the job like ones from online electrical outlets and other high street stores. Please Note! Please make sure you order the correct parts, if you are unsure, please email us for help. We do not accept correctly supplied electrical goods for return, refund or exchange. All items are tested before dispatch and cannot be accepted back for refunds. Buy A Macerator Capacitor Condenser Now!